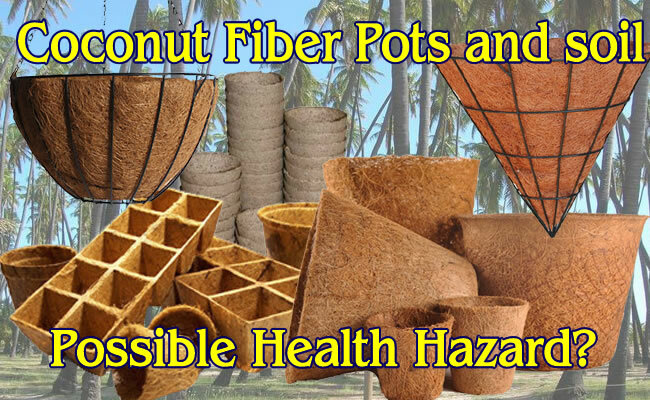 Coconut Fiber For Your Plants. Good Or Possible Hazard? Could your potting soil or pots be detrimental to your health? Quite a few potting soils today use Coconut Coir Fiber instead of sphagnum peat moss as the base for their mixes. It’s that fibery stuff that comes between the outer shell of the coconut and the inner bit that you eat. This material is trumpeted as better since it is a renewable resource from coconut trees and it is easily sterilizable. Once hydrated it can hold almost nine times its weight in water and then allow the rest of the water to drain away without getting waterlogged. It can be milled fine to be used in seed starting mixes or left with slightly longer fibers for use in potting mixes for larger plants. Most gardeners are probably more familiar with Coconut Coir Fiber being used as hanging basket planters and small biodegradable pots. These have been gaining in popularity recently for two reasons: first they don’t break down quite as fast as peat pots making them easier for many people to handle, and again they are trumpeted as a renewable resource. But sadly they are not renewable. Not any more. The problem is there is no cure. There are just two choices. 1. Cut down and burn any infected trees to stop the spread of the disease. This second method is being used extensively in resort areas. Most areas that rely on tourists want to keep their palm trees. After all that’s what the tropics are about. How can you have an exotic tropical resort without the palm trees? No one wants to be around a bunch of ugly dead tree stumps. Areas like Florida also use OTC on their ornamental trees. 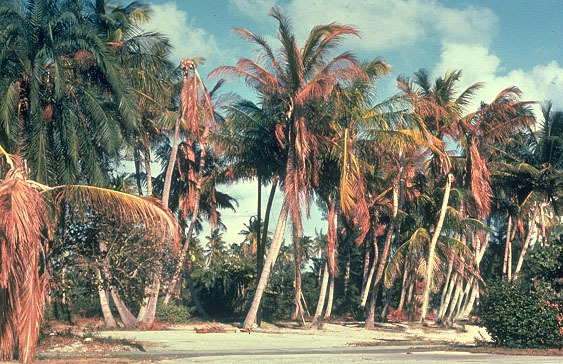 Over the last 40 years Florida has lost a huge number of palms especially coconuts to LYD so using antibiotics to keep the ambiance in places like the Florida keys is essential. They also put out leaflets warning everyone NOT to eat the fruits (coconuts) of the treated trees . A fairly high level of antibiotics is needed to keep the trees ‘healthy’ a lot of that is going to get concentrated into the fruit. You really don’t want to eat that. The crisis of the coconut is massive, but the demand for coconut products is still rising. With the advent of coconut water in the last few years heralded as the ‘latest super food’ demand is increasing not decreasing. 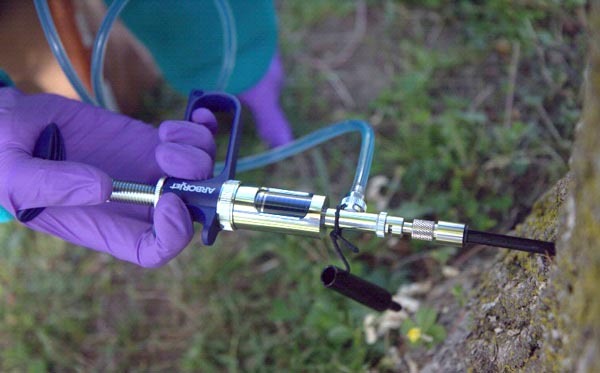 While research into the problem continues trees are being fed antibiotics. In countries where the coconut is the main agricultural staple providing most of their export products financial ruin may occur if all the trees die and their crops are decimated. Whether these plantations use antibiotics to stave the disease off their trees is unknown, it’s unlikely they are going to advertise the fact to anyone. Perhaps the fruits are not being incorporated into our food chain but what about the fiber? This is not a food so it would not come under the same rules. There is nothing to stop anyone grinding up the fiber from treated trees and selling it as potting soil or using it for plant starter pots. 1. It’s fairly stable in soil and can last around 10-15 days on it’s own in cool soil..
3. Much more stable in the dark. What does this mean for your starter pots. Since OTC breaks down in sunlight its probably fine for hanging basket liners where they are exposed to the sun a lot. If using coconut fiber starter pots make sure that the pots have a lot of sun exposure from the moment that they are used. Do not crowd them together or put them in an area where they don’t get a lot of light. What about the potting mix? Its hard to determine exactly how long the antibiotics are going to stay around in the soil. It could be a few days or it could be up to 60 days. The research that does exist on antibiotics and OTC in the soil all states that there is a reduction in soil biology and activity. Basically it kills off all the good stuff in the soil that you really need to make your plant healthy. The only way that they were able to improve the soil biology again was to add manure which basically reintroduced a lot of the microflora that they had just killed off. Is OTC taken up by the plants? So Is it safe for me and my family? The simple answer is no one knows. For safety refrain from growing anything that you intend to eat in soil that may have antibiotics included. Flowers and other plants that are not intended for consumption are most likely fine but bear in mind that you may be destroying your soil biology when planting this material in your garden. Eziashi, E.* and Omamor, I. Front Plant Sci. 2016; 7: 1521. McKellar, Quintin; Horspool, L. J. Toxicity of the antimicrobial oxytetracycline to soil organisms in a multi-species-soil system (MS.3) and influence of manure co-addition. Boleas S1, Alonso C, Pro J, Fernández C, Carbonell G, Tarazona JV. J Hazard Mater. 2005 Jul 15;122(3):233-41. Epub 2005 Apr 7. Clin Infect Dis (2002) 34 (Supplement_3): S107-S110. Author Janice Hazeldine PhDPosted on April 10, 2017 Categories garden concepts, health and hazards, plantsTags coconut coir, coconut coir and health, coconut coir harzard, coconut fiber a hazard, coconut fiber and health, coconut hazard, lethal yellowing diseaseLeave a comment on Coconut Fiber For Your Plants. Good Or Possible Hazard?